If you’re Canberran, which you probably are if you’re reading this, then you probably already know all about 19-year-old Kofi Ansah, stage name Genesis Owusu. If you know much at all about him, then this EP can’t disappoint. The seven-track project consists of three interludes and four tracks, one of which is completely fresh for the EP. The other three, ‘Goondocks/Cbr Zoo (Sabertooth)’, ‘Void’, and ‘Drive Slow’ are staples of the Genesis Owusu live set. The new track, ‘Blue Pills’, is exactly in the vein of the others. For these reasons, Cardrive EP will satisfy an already existing fanbase and is perfect for new listeners. 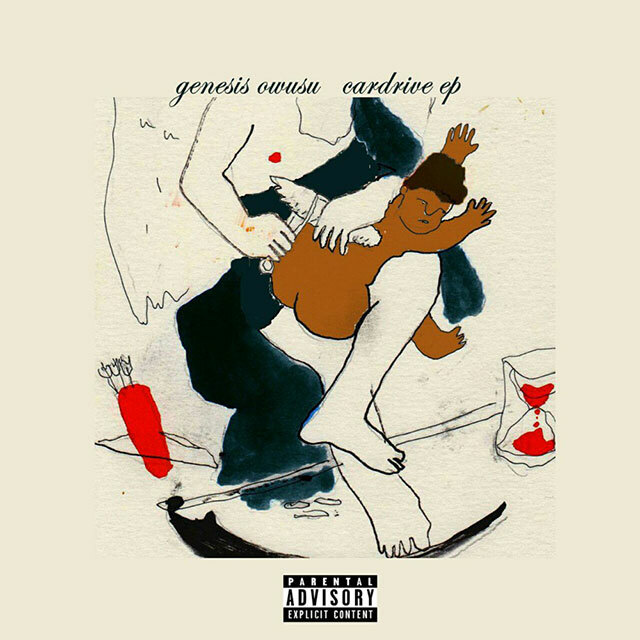 Genesis Owusu’s sound reverberates throughout each track – the throaty, deep voice, the swagger-infused flow and menacing, jazzy beats give each track a distinctive flavour. Additionally, the polished sound and confidence with which each tune is presented gives the sound an experienced feeling that belies the age of the artist. Each beat on the tape compliments the sound exceptionally, contributing to the album’s vibe by providing a sound that contains the same mood and thinly veiled aggression in the lyrics and delivery. The best beat on the album, for this, is ‘Goondocks…’ – the beat shows this alluded-to menace, before the beat switch completely rips open the tune and changes the entire experience. The confidence is nothing new – the swagger’s always been there, from debut track ‘Ansah Brothers’, where he rapped “twice your favourite rapper’s talent, only half of his age” as a 15-year-old. Since then, he’s developed his sound alongside his brother and fellow local rapper Citizen Kay, most recently dropping collaborative tape Polaroid in 2015. However, on ‘Blue Pills’, he raps “finally getting recognition without brother CK”, showing that he’s looking to move in his own direction and get his name out there under his own steam, and with this release he’s made the perfect move to start doing that.